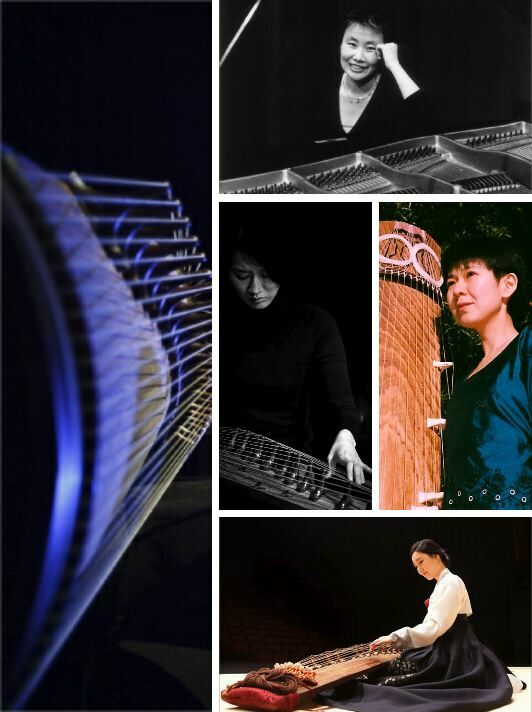 Shoko Hikage, koto (Japanese zither) Kyungso Park, kayageum (Korean zither) JiHye Lim, kayageum. JiHye Lim received a master's degree from the Korean National University of the Arts with a specialty in the traditional Korean instrument, the gayageum. She has given performances with the Korean Broadcasting System (KBS) Traditional Music Orchestra and the Se-Jong Traditional Orchestra and was awarded the 1st prize in the 35th Nange Traditional Music Competition. Lim is currently an instructor and Administrative Assistant in the Traditional Arts Division of the Korean National Institute for the Gifted in the Arts. As a gayageum player, composer and improviser, Kyungso Park demonstrates equal expertise in both traditional and contemporary art. She is active in expanding the scope of gayageum music and in challenging its traditional boundaries. Since her debut in 2004, her solo performances and collaborations have delved into many genres; these include avant garde improvisation, experimental music, new music, jazz and gayageum sanjo (an improvised instrumental solo from the late Choseon era). She has given concerts throughout the United States, Europe and Asia. Park has released 5 albums including her newest single Be My Neighbor (2014) and full album Dung-tta (2011). Amsterdam by the Barton Workshop (2006), in Seoul by JeonGaAkHoe (2009) and Buam Arts (2009), at Texas A&M University (2007) and in San Francisco and Santa Cruz, California by New Music Works in 2012. She is now working on a piece commissioned for the San Jose Chamber Orchestra for the 2016-17 concert season.She is the author of the bilingual book Conversations with Kayageum Master Byung-ki Hwang (Pulbit Press, 2001). Her music has been recorded on the Fontec (Japan), Top Arts (Korea),Seoul (Korea) and New World Records (US) labels and has been published in Korea and Australia. Since 2006 her music has been published exclusively by Lantro Music (Belgium). Shoko Hikage began playing koto at the age of three. Her first teacher was Chizuga Kimura of the Ikuta-ryu Sokyoku Seigen Kai in Akita Prefecture, Japan. From 1985, she received special training from the 2nd and 3rd IEMOTO Seiga Adachi (hereditary head master of the Ikuta-ryu Sokyoku Seigen Kai). In 1988, Hikage graduated from Takasaki College with a major in koto music. She was then accepted as a special research student (uchideshi) at the Sawai Sokyoku In(Sawai Koto Institute) under Tadao and Kazue Sawai, where she received her master's certificate (kyoshi). Hikage also completed a one-year intensive seminar at the Sawai Sokyoku In. In 1992, she moved to Honolulu, Hawaii to teach koto at the Sawai Kotot Kai Hawaii (Sawai Koto Institute Hawaii branch) and at the University of Hawaii. In 1997, she moved to San Francisco where she continues her concert and teaching activities. Hikage premiered Hyo-shin Na's “Crazy Horse" for Korean Traditional Orchestra and Koto Solo with the National Orchestra of Traditional Instruments in Seoul, Korea in November, 2011. In the Bay Area, she also premiered Hyo-shin Na’s " Night Procession of the Hundred Demons", "Koto Music" and "Koto Ninano". In 2014, Hikage gave a solo recital with a program devoted to Hyo-shin Na's music for koto/bass koto at Buam Arts Hall in Seoul, Korea. The second CD of her playing of Na's music was released on the Top Arts Label in February 2015.